Oct. 17, 2005 — This Halloween, why not indulge your eerie pleasures at one of Lotte Hotel's spook-fest parties that will just about bring down the roof! Starting on Thursday and Friday, the 27th and 28th, ghouls and goblins can visit Bobby London at Lotte Hotel Seoul and at Peninsula on the 28th also at Lotte Hotel Seoul. 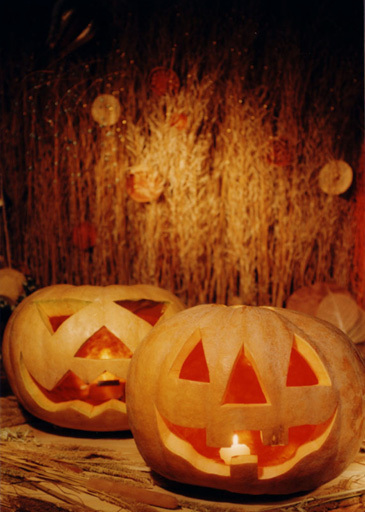 And to continue the fun, a Halloween bash will kick-off at Lotte Hotel World's Lobby Lounge on Saturday the 29th. Among the usual Halloween creepy things; Jack-o-lanterns, bats, and skeletons will be in full force with eerie fog-filled atmosphere and the sights and sounds of terror! Each party will have its own distinctive offerings, such as at Bobby London at Lotte Hotel Seoul, a live band opens up the festivities starting at 5pm and later on, a professional chat-show host will MC events including a dance party, Halloween quiz, magic show, and lucky draw. Additionally, a complimentary cocktail will be served to ladies and complimentary table snacks will be offered to tables of ladies joining the party. And no entrance fee is required to attend. At the Lotte Hotel Seoul's Peninsula, a standing buffet is offered from 7PM that includes unlimited beer and a wine-tasting, as well as a variety of events such as costume parade, games, and lucky draw. And a dance party hosted by a guest DJ will help bewitch you. Entrance is 39,000 per person and VAT & service charge are included. Over at Lotte Hotel World, the Lobby Lounge features an Antipasto Buffet with wine and unlimited beer beginning at 7p.m., and a chat-show host will DJ the best music mix for the evening. A live band featuring electronic violin will raise the level of excitement while Halloween activities will complete the fun and will include a divination event, special Halloween make-up event, and a dance battle to raise the roof and bring down the house! A lucky draw adds another exciting opportunity to enjoy the party, and complimentary Halloween masks will be given to the first 300 in attendance. Entrance is 50,000 per person and VAT & service charge are included. Inquiries should be made by calling the Lotte Hotel Seoul at -02-771-1000 or Lotte Hotel World at 02- 411-7751. For other inquiries call its PR Officer Gina Kong at 02-759-7560, or her cell phone at 017-707-4138.